Deadline for submitting your projects is Wednesday, April 2nd, at 11:59 PM U.S. Central Time. 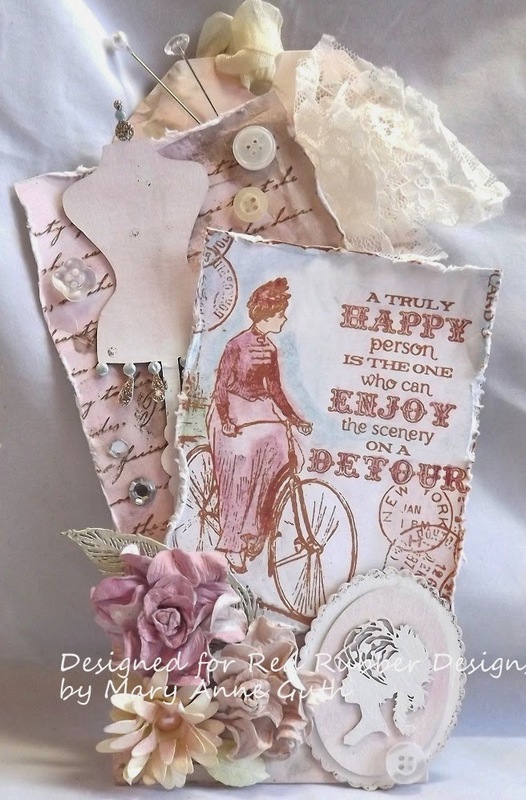 As an example, I've created this vintage tag featuring the Beauty of a Woman background stamp and Enjoy the Scenery stamp from Red Rubber Designs. I first stamped the Beauty of a Woman stamp on a bit of Premium White Cardstock using dark brown ink and then spritzed it with a pink spray. Next I seriously distressed the edges before popping it onto a premade tag. I tucked a little bit of old lace behind this panel and painted and distressed a chipboard dress form to go over it. Next I stamped the Enjoy the Scenery stamp and colored it with colored pencils and using a gamsol magic technique. This image was also heavily distressed and then placed over the script panel. Next was the fun part adding all the different embellishments. Finally I wrinkled some seam binding and used that for the top of my tag. 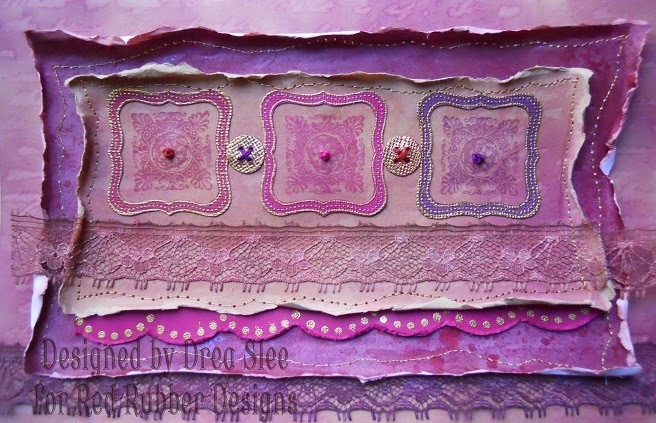 Next we have some inspiration from Andrea Slee using Circles of Love, Script Background, Victorian Embellishments, and Fabulous Frames . I just love the bright colors she used and all that gold stitching. I hope you are inspired by my Inspirational this week and link up a newly created project to this post before the deadline. I am looking forward to being inspired by you.